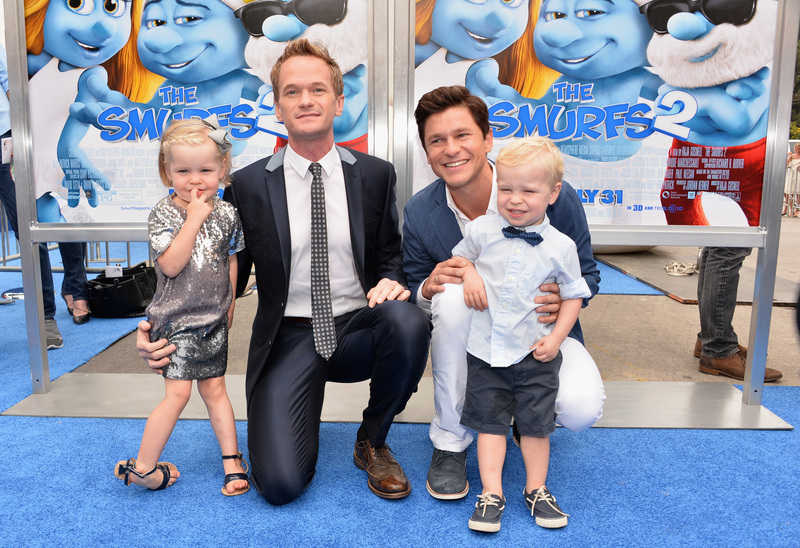 One of the cutest celebrity families continues to prove why they are beloved. Neil Patrick Harris' family Halloween costume was shared on social media by the actor on Monday and it is perfection. Harris, David Burtka, and their twins, Harper and Gideon, donned costumes honoring old Hollywood. As a huge fan of that era, I've never been more thrilled over a Halloween costume, nor have I seen a better one honoring some of the biggest stars and icons to come out of Hollywood. In his Instagram caption, Harris said it best when he wrote, "Hooray for Halloween!" Get it? Like, "Hooray for Hollywood"? If not, "Hooray for Hollywood" is a famous song from the 1937 film Hollywood Hotel. As you can see below Harris is Groucho Marx, Burtka is Charlie Chaplin, Harper is Marilyn Monroe, and Gideon is James Dean. Not only are their costumes on point, but their poses (I bow down to Harper) are everything and more. Be sure to also take notice of their location in the image. The fact that they took this photo in an old theater brings the costume to a whole new level. According to Burtka, they had a great time getting dressed up and taking photos this year. "We had so much fun with this one!" he wrote on Instagram. "Happy Halloween everyone. Make sure to eat LOTS of candy. But don't forget to brush your teeth." If anyone deserves a lot of candy as a reward for their Halloween costume, it's these four. Or how about when they embraced Star Wars? As amazing as all of these costumes are, I think the Hollywood one might be my favorite. Though, that assessment might change come next year when Harris, Burtka, Harper, and Gideon once again create another spectacular group Halloween costume.